Geoglobe is a blog about GIS, virtual globes and other geographic information bits and pieces, written by a GI professional. It started as a working sketch pad of ideas, links and notes for the dissertation project for my MSc GIS at Edinburgh University. Got ski fever today.. and since I can't afford or have time to jet off in search of snow, I thought I'd do some (web) surfing instead. 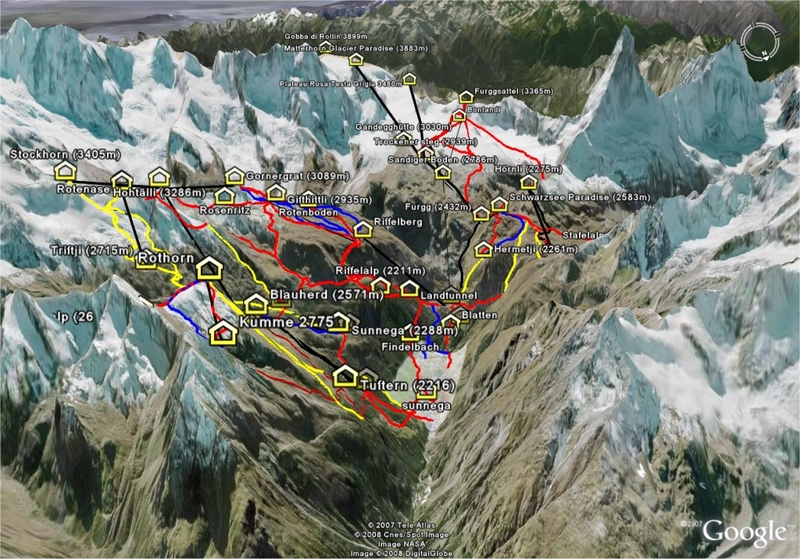 Below, a bunch of links to some ski resources in Europe, mainly the Alps. I started looking mainly at the KML out there. One of my favourites is one of the Swiss Alps resort of Zermatt posted by GE Earth Community member TommyAfrika. 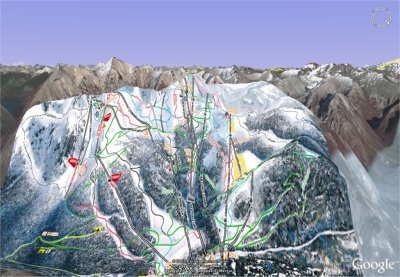 It shows the location of the various resorts around the region, many of the trails and pistes and best of all, it's in glorious high resolution imagery. Click the thumbnail below for a better view. the Tyrolean Alps. Not so many trails, but certainly a great list of resorts over in Austria. Eastern Europe is catered for by KML's for both Slovakia and the Czech republic by GEC member maco. Further afield, in Argentina, Gerardo64 GEC member, has done a trail map overlay of the Cerro Catedral ski centre, Bariloche. It's a nice little KML of a part of the world I haven't done much exploring in. His post is also nicely annotated with photos of the resort, and winter fun! In terms of a single KML for a huge list of resorts all over the globe, you could do worse than GEC member 1will's placemarks and links to snow reports. Not the most descriptive of placemarks, but there are an awful lot of them! Finally, the GE blog has some interesting posts on mapping your ski trails in Google Earth using Geovisualiser. His KML is really interesting, and is colourised either by altitude or speed. So take your GPS with you next time you go skiing! There is of course much more ski related KML out there, and this is just a selection from a few hours I've spent browsing. Sadly, quite a few of the older bigger KML's from a few years ago now have broken links and so have not been included. Couldn't find one for Scotland though..so maybe I should start work on that myself! April catch up - Glencoe, FutureTV and news.